From the moment I first took a bite of this fabulous dish I knew. Chicken & Wild Rice Casserole and I were going to be life long friends. It’s the perfect combination of creamy, nutty, healthy goodness combined with the comfort that comes from a warm bowl of homemade chicken soup. Wild rice is fabulous on it’s own as a side dish. It’s naturally low in fat, high in fiber, and a good source of protein. It takes a little longer to cook than standard long grain rice, so when making this casserole you may want to make the rice the day before to cut down on the overall cooking time. Same goes for the chicken, this is the perfect dish to come the day after you roast a whole chicken. 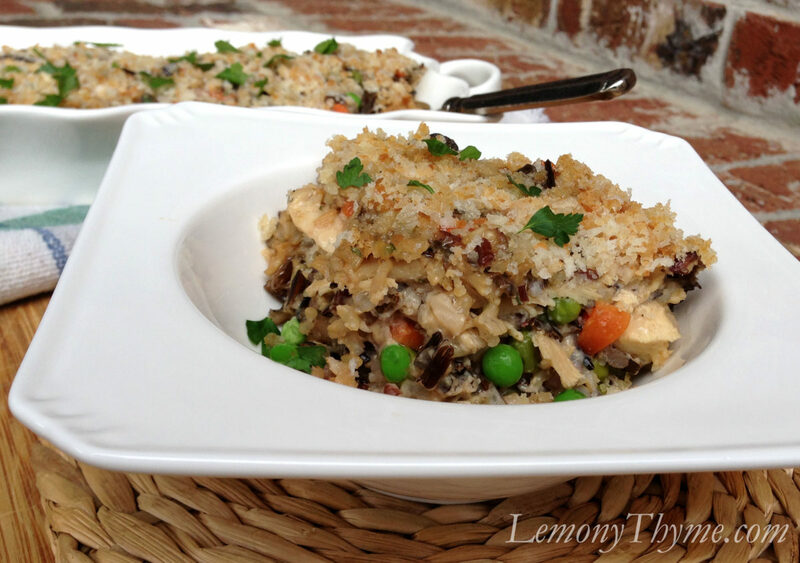 Chicken & Wild Rice Casserole is a hearty dish. Over the years I’ve replaced some of the higher fat and sodium laden ingredients to come up with a full flavor, yet lighter ‘fresh’ version of this beautiful dish. Serve with a side salad for a wonderful family meal. The casserole can be made a day ahead and then baked before serving. Chicken & Wild Rice Casserole is the perfect combination of creamy, nutty, healthy goodness combined with the comfort that comes from a warm bowl of homemade chicken soup. Prepare wild rice according to package instructions, using chicken broth instead of water. Preheat oven to 350 degrees. Coat 3-quart casserole dish with cooking spray. Meanwhile, add olive oil to a Dutch oven, sauté onion, carrots, and celery for 5-7 minutes until just tender. Then add the mushrooms, fresh thyme, salt, and pepper and cook 2-3 minutes. Dust vegetables with flour, cook for 1-2 minutes, then gradually add in evaporated milk, stirring constantly. Bring mixture to a boil; then reduce heat to low. Add in Laughing Cow wedges and parmesan cheese, stirring to combine. Remove from heat, stir in cooked wild rice, cubed chicken, and frozen peas. Adjust seasoning to taste. Pour into prepared casserole dish. In a small bowl, combine breadcrumbs and chopped parsley. Sprinkle over top of casserole. Spray lightly with cooking spray. Bake for 25-30 minutes until topping is lightly browned and mixture is bubbly. Allow to rest 10 minutes before serving. Another five-star recipe! I had left-over wild rice to use and found this recipe. I purchased a rotisserie chicken and shredded it up. I didn’t have any frozen peas so I subbed in edemame (soy). Oh my goodness … it turned out soooo good. Thank you again for a great recipe. Donna, I’m so glad you made this and enjoyed it. There’s something so grand about wild rice to me. I just love it. YES – it was delicious!!! I grew up in NC where everyone cooks a ton of casseroles & chicken casserole was always one of my favorites! I love this healthier option! I made it with whole wheat flour & whole wheat bread crumbs. SO GOOD!!!! Thank you!!! !